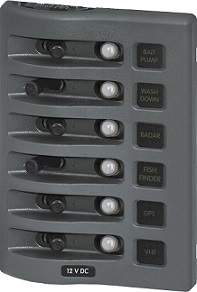 • Designed for flybridge and open cockpit applications. 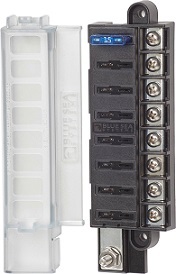 • Panel is rated IP66—Protected against powerful water jets. 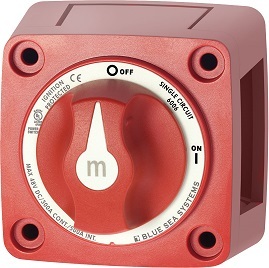 • Ignition protected safe for installation aboard gasoline powered boats. 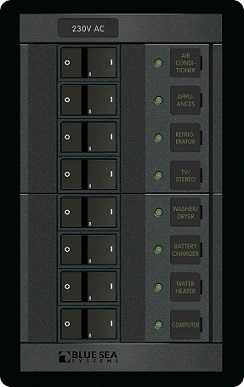 • ON-OFF Contura Switches. • ON indicating LEDs embedded in switch. • Watertight mounting gasket. 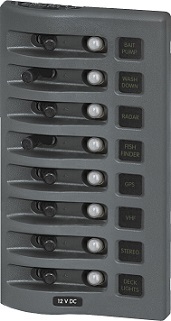 • Push Button Reset-Only circuit breakers with waterproof boots. • Rated IP67-temporary immersion for 30 minutes. 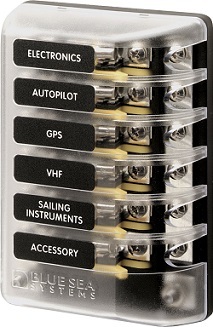 • Designed for flybridge and open cockpit applications. • Independent label backlighting allows switching and dimming. 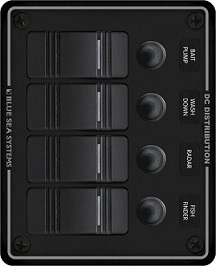 • Compatible with all Blue Sea Systems Digital Dimmers. 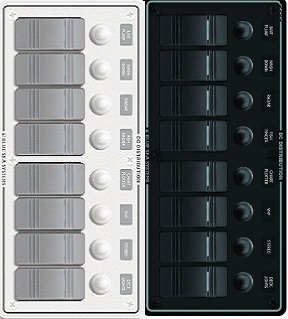 • Available in 4 and 6 circuit models. • Each panel can be mounted in four different orientations. • Green LEDs aid low-light readability. 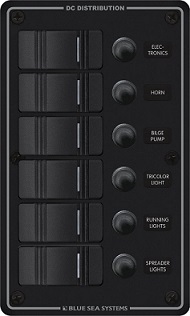 All labels will be lit when the panel is powered, regardless of individual switch position. 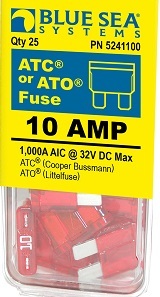 AC Branch panels distribute current from a high amperage input into lower amperage circuits. All circuit label positions are backlit. “ON” indicating LEDs installed in all circuit positions. • Corrosion resistant, tin-plated copper fuse clips reduce heat and improve the efficiency of the electrical system. • Clear insulating cover with label recesses accepts Small Format Labels. • Spare fuse holder in cover. 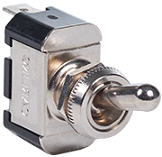 • Accepts ring or snap fork type terminals. 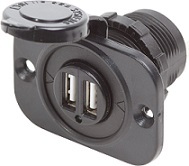 • Includes two terminal block jumpers. • Single side design allows wire entry from one side to minimize footprint.• Insulating cover meets ABYC/USCG insulation requirements. • Tin-plated copper buses and fuse clips. 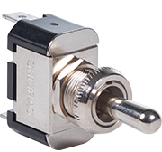 • Accepts ring or snap fork type terminals. 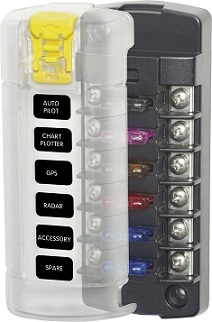 • Includes 8 write-on circuit labels. 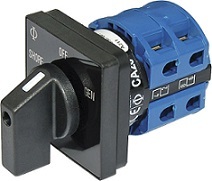 Innovative design allows for labeling, spare fuse storage, and easy fuse removal. • Clear insulating cover with label recesses for accept Large Format Labels. 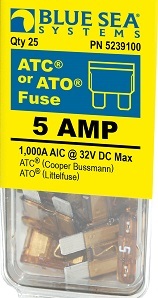 • Cover insulates all conductive parts, satisfying ABYC/USCG requirements and storing spare fuses. 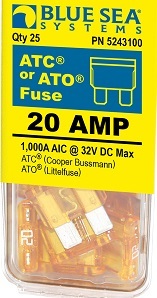 • Tin-plated copper buses and Phosphor Bronze fuse clips give 30 Ampere rating per circuit. • Meets American Boat and Yacht Council (ABYC) standards. 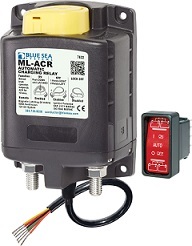 • The industry standard circuit breaker for Blue Sea Systems" electrical panels. Combines swtiching and circuit protection into a single device. • "Trip Free" design cannot be held "ON" during fault current condition. 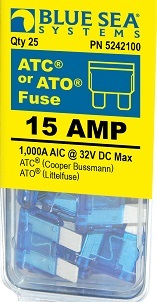 Provides circuit protection for 25 to 150 Amp loads when switching and circuit protection are both required. 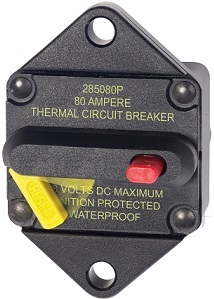 Circuit Breaker Type: Thermally responsive Bi-metal blade. Circuit Breaker Class: Type III - switchable/manual reset - trip free. 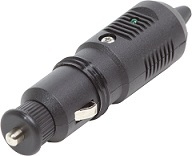 Terminal Stud: M6 (accepts 1/4" Ring Terminal). 500 Amp magnetic latching (bi-stable) relay automatically combines batteries during charging and isolates batteries when discharging and when starting engine. 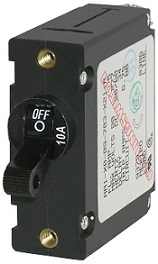 • Compact solution when circuit protection is provided elsewhere. 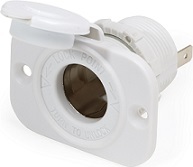 • Allows connecting one of two different AC sources to one circuit. 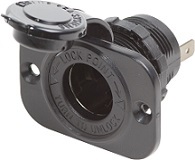 • Mounts in panels up to 0.16" (4.00mm) thick. 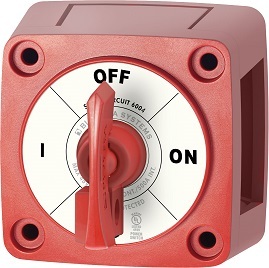 • Heavy duty industrial rated switch.